In 1947, Evie Mitchell, along with 5 year-old son Billy, follows her historian husband Martin to India as he documents the end of the British Raj. Their marriage is suffering ever since Martin returned from the war in Europe, emotionally scarred and reclusive. Evie is lonely until she discovers hidden letters of two English women, Adela Winfield and Felicity Chadwick, who had lived in India in the same house almost a hundred years ago during the Sepoy Revolution in the 1850s. In time she also discovers journal entries, and reading about their lives has a profound effect on her. The backdrop of exotic India during two revolutions at different time periods made this book an exciting read for me. I was transported back in history and the author's depiction of India was so real, both in its foreign beauty and stark living conditions. I could smell the spices and the cow dung, taste the hot curry dishes and see the colorful silken saris billowing in the dusty air. The book goes back and forth between the two stories until they merge at the end. I could relate to Evie's desperation in trying to save her marriage, and I felt for Martin's emotional pain that was destroying his family life, although it was clear he loved both his wife and his boy. Adela and Felicity's story was about their love for living an unconventional life. Felicity wanted to return to her beloved India, where she'd spent the first few years of her life, to live a life free of aristocratic constraints. Adela did not want to marry because she preferred women over men. I have to admit that when I first read that she was physically attracted to Felicity I was very uncomfortable and debated whether I should keep reading. But Felicity does not reciprocate these feelings, loving Adela only as a sister. Adela then hooks up with her maid (what?) until she is discovered by her parents and is sent off to India to be with Felicity. I felt this was a ploy in the plot to get Adela to India as part of the Fishing Fleet, a group of eligible young women sent to meet eligible bachelors among the British in India. After this incident, the topic veers away from this subject. The book contains a few sexual scenes, religious profanities and I think two f-words. Once Adela gets to India, both stories really pick up for me. Felicity meets a wealthy Indian man in the midst of Indian unrest and Adela's journals chronicle their life and the changes that take them unawares. It was tremendously sad, heart-wrenching and exciting at the same time. The times were dangerous, their love forbidden, and their cultures clashing just like a hundred years later when Evie is living in India during the Partition. India's history was so interesting to read about that I couldn't put the book down at this point and read the whole evening to finish it. I loved the ending. 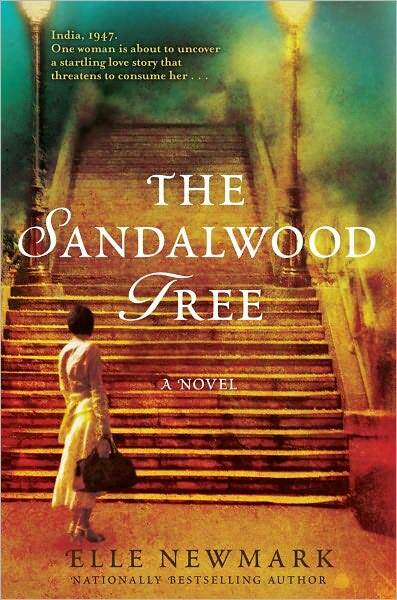 The Sandalwood Tree is a well-written book that immerses the reader in an exotic world. It has given me the desire to read more books set in India. Elle Newmark is an author whose books are inspired by her travels. Her work has been published into 16 languages and she lives in the hills north of San Diego with her husband, a retired physician. She has two grown children and five grandchildren. Disclosure: Thanks to Pump Up Your Book Virtual Tours for sending me this book for review. I was not compensated in any other way, nor told how to rate or review this product. There are not too many books written about historical India and this one sounds like a good one. Nice review! I love to read about different cultures, so I've been interested in this book. I'm glad to see it's so good! I am glad to see you liked this book. I think the historical aspect makes it very interesting. I will be putting this on my wish list. Thanks for the honest review. I am so tagging this one down now. I really enjoyed your review which narrowed down just how much this is a worthwhile read. I've seen this book before somewhere (perhaps on another blog) and I thought it looked very interesting. I do love books set in India - they're so different. Great review, Laura! 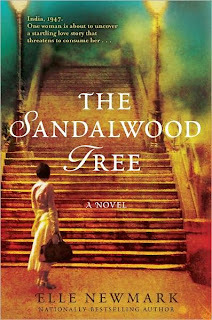 The Sandalwood Tree is the kind of book that I usually enjoy immensely. Your review was excellent, Laura and put us on guard to the sexual content. Thanks.